As Samsung gets ready to launch legal action against the iPhone 5 — which, at this point, hasn’t even been announced — and the companies furiously trade jabs at each other in courtrooms around the world, we thought it would be useful to step back and look at the big picture. Why are Apple and Samsung fighting, anyway? What’s at stake? Haven’t the companies famously worked together to build some of Apple’s iconic products? Catch up on the scuffle with our in-depth FAQ. Apple. The first shot in the Apple-Samsung battle was fired by Apple in mid-April when Apple filed a suit in U.S. District Court alleging that several Samsung Android-based smartphones and tablets infringed on Apple’s intellectual property. Apple’s original suit against Samsung covered the Samsung Nexus S, Epic 4G, Galaxy S 4G, and Galaxy Tab. Aren’t Apple and Samsung partners? Yes. Samsung is the world’s largest maker of memory chips, and Apple is one of the world’s largest consumers of flash memory — the storage that’s inside all iPhones and iPads, as well as most iPods and a growing number of Macintosh computers. As recently as February of this year Apple inked a $7+ billion deal with Samsung to buy flash memory in bulk to fuel its iPhone and iPad product lines. Samsung also manufactured the A4 processor used in Apple’s original iPad, along with the processor used in the iPhone 3GS. The litigation between the two companies is ironic because Samsung was earning good money on its relationship with Apple. It was powering Apple’s hottest products, and Apple’s massive flash memory buys were buoying the entire market, shielding Samsung from some price competition from other flash memory makers. However, the litigation has soured the relationship: Apple is reportedly looking to a new chipmaker to power the iPad 3, and a former Samsung executive has admitted to leaking confidential information about the original iPad prior to its launch. Although Apple has tons of cash in the bank, it’s not practical for Apple to cut all ties with Samsung: Apple will still have to rely on Samsung for supplying some components used in its mobile and computing products. However, the current rancor means Apple has undoubtedly diversified its supplier base so it’s less reliant on the South Korean giant. Is Apple suing Samsung over Android? No. 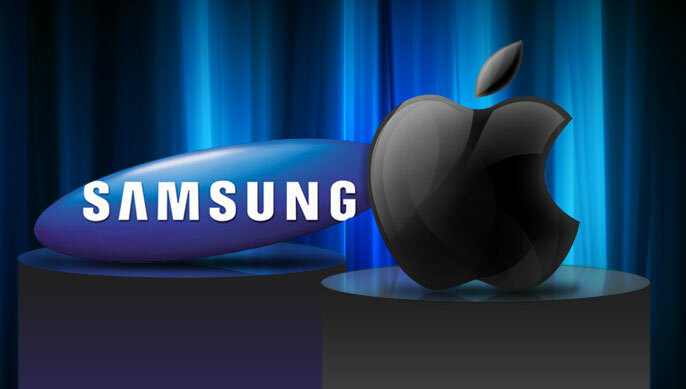 Although Apple is alleging Samsung infringes Apple patents, Apple is not suing Samsung over using Android. So far, Apple has not launched direct legal action against Google’s Android operating system, although its legal battle with phone maker HTC (itself turning into an epic saga) is largely viewed as a proxy battle over Android. What does Apple claim Samsung is copying? Apple technology, but also user interface and product design. Most legal battles in the high-tech world center on obtusely-worded patents, but Apple’s complaint against Samsung is notable because it also focuses on overall product design and onscreen interface — often called “trade dress” issues. Apple’s original suit accuses Samsung of infringing on seven technical patents related to user interaction, specifically pinching, zooming, scrolling, and selecting. Apple also says Samsung violates three design patents, including one covering the flat black face of the iPhone and iPad. Apple’s first suit juxtaposed the iPhone 3GS and Samsung Galaxy S i9000, arguing the Samsung product’s style, user interface, and even packaging were essentially copies of Apple’s work—getting down to even the icons used for various apps. In subsequent suits in other venues, Apple has submitted additional materials comparing the design of Samsung’s Galaxy Tab 10.1 and Apple’s iPad 2 — Apple was also accused of submitting tweaked images to make the products seem more comparable. Who took the fight global? Samsung. And they wasted no time about it: Within a week of Apple’s initial lawsuit in the United States, Samsung fired back in Germany, Japan, and its native South Korea. Samsung then brought the legal battle back to the United States, but within six weeks dropped this suit to “streamline legal proceedings,” opting instead to make its case in counter-claims against Apple’s original U.S. lawsuit. Since then, both companies have launched litigation in each other in other countries. Apple took its claims against Samsung to South Korea, Australia, Japan, and the European Union (which has currently contracted into a battle covering just Germany). In cases where Apple initiated suits, Samsung has counter litigation filed. Samsung is going after Apple in France. What does Samsung claim Apple is copying? Samsung’s counter-suits allege Apple’s iPhone and iPad infringe on selected Samsung wireless communication patents covering methods of handling phone calls and data simultaneously, reducing interference between devices, processing text messages and attachments, and improving network efficiency. The specifics vary by country: in Korea, Samsung accused Apple of violating five patents, but the German case alleged three and the Japanese case covered just two. In the United States, Samsung is basing its counterclaims against Apple on 10 alleged patent infringements. These are the same technology patents Samsung is expected to use as the basis of a new lawsuit against the iPhone 5, when it debuts. The number of patents involved varies by country because different nations have different processes for patent applications, processing, and eligibility. It’s also entirely possible for a company to have a patent on a particular technology in one country, but for the same technology to be patented by a different company in another country. Apple hasn’t fully detailed what it’s seeking from the lawsuits, but in each case Apple is focusing on an injunction barring the sale and marketing of Samsung’s allegedly-infringing products in a particular market. That’s also the most damaging thing it can do to Samsung: If it can prevent the company from offering its Galaxy smartphones and Galaxy Tab for sale, Apple removes one of its most aggressive competitors from the market and forces Samsung to go back to the drawing board and re-tool its top-shelf Android offerings. If the cases continue to move toward trial, Apple will have to get more specific with what it’s seeking in each case. Apple will likely seek compensatory damages (to make up for sales lost to Samsung) and punitive damages (to discourage Samsung and other companies from infringing again). In the U.S. case, at least, Apple has also indicated it would seek “reasonable funds for corrective advertising” to mitigate any market confusion resulting from Samsung’s alleged infringement. Much the same thing as Apple: It’s seeking an injunction barring the import and sales of infringing Apple products into the markets where it has filed lawsuits. That would mean the iPhone, iPad, and potentially other products like the iPod touch would not be available in major markets, including the United States, Europe, and many Asian markets. Why sue in so many countries? To raise the stakes. By taking their cases to new venues, Samsung and Apple not only increase the other’s outright costs to defend themselves, but also increase the pressure on each company to sit down and hammer out a settlement. Most industry watchers don’t actually expect all these lawsuits will get to trial. More likely, the companies will duke out the first few rounds in court and in patent review, then work out some agreement based on which way the winds seem to be blowing. In the meantime, both companies are vying for the most advantageous position. So far, Apple — but there’s a long way to go. Apple lawyers scored a surprising early victory against Samsung when their request for a preliminary injunction against the Samsung Galaxy Tab in Europe was granted. Winning a preliminary injunction essentially means the court felt the plaintiff’s case was strong enough that a ban on sales was justified until the matter could be officially resolved in court. It’s rare for preliminary injunctions to be granted in high-tech patent battles. Although the court’s ruling was later scaled back to apply only to Germany rather than the whole European Union, Apple then won a permanent injunction against the Galaxy Tab 10.1 in Germany. In practice, the German injunction doesn’t mean much. It only prevents Samsung’s German subsidiary from selling the Galaxy Tab 10.1; the device can still be sold to Germany customers by other Samsung divisions or retailers outside Germany. But it is nonetheless a significant legal and public relations victory for Apple. Apple also won an injunction on selected Samsung smartphones in Europe, although the injunction only applies if the devices are running Android 2.2: if they get upgraded to Android 3.0, they can be sold in Europe. The ban is scheduled to go into effect October 15. Samsung has also been forced to delay the Galaxy Tab 10.1 in Australia over the litigation, and was forced to very publicly remove the Galaxy Tab 7 from the IFA show floor earlier this month after Apple was granted a second injunction barring the sale and marketing of the tablet in Germany. Samsung seems intent on protecting its Galaxy smartphone and tablet product lines by spawning litigation. Given the slow pace of court systems, it’s possible Samsung can draw proceedings out long enough that the cases won’t get to court until after the products have been withdrawn from the market. And at this point, it’s safe to assume Samsung’s designs for future smartphones and tablets will bear less “trade dress” resemblance to Apple products. Apple’s early injunction victories could pose a threat. So far, Apple has successfully built momentum — at least in Europe —to keep Samsung Galaxy’s products off the market, and Samsung has already held them back in Australia. Apple may be able to leverage those victories into an upper hand in settlement negotiations. If “trade dress” issues get resolved or put into the history books, Samsung and Apple will have to battle it out on technical patents. The first move in these cases is usually to demand re-examination of the patents in question. That process can easily take more than a year, with initial findings coming after several months, and appeals processes dragging out much longer. Assuming both companies patents hold up — which involves examining both the validity of the patent and determining whether a product infringes on it — the most likely resolution would be a settlement, possibly with one company granting patent concessions or royalties to the other if the infringement burden is uneven. Although the cases might drag on for years, pure patent battles rarely make it all the way to trial, let alone a series of separate trials in half a dozen (or more) countries.